Rep. Adam Schiff's Sister is Married to George Soros' Son-Fiction! - Truth or Fiction? Rep. Adam Schiff's Sister is Married to George Soros' Son-Fiction! Rep. Adam Schiff’s Sister Married George Soros’ Son-Fiction! U.S. Rep. Adam Schiff’s sister is married to George Soros’ son, explaining the California Democrat’s vocal opposition to President Trump. 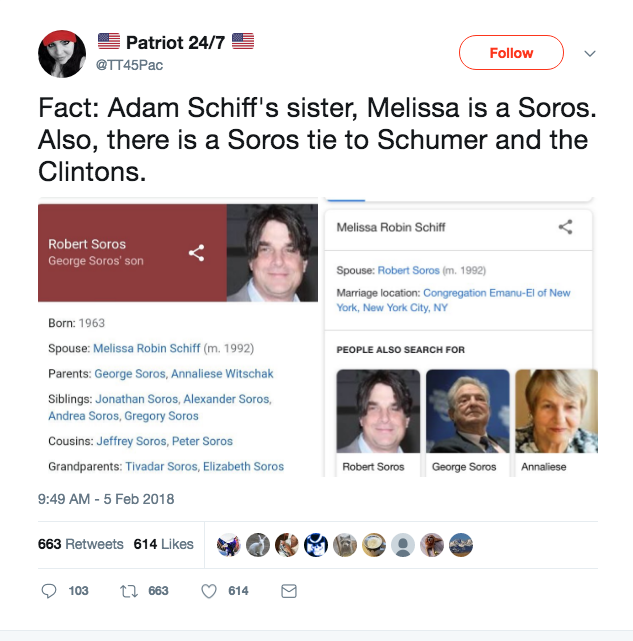 George Soros’ son married a woman whose surname is “Schiff”— but she’s not Adam Schiff’s sister. As congressional investigation into potential collusion between the Trump campaign and Russians heated up in February 2018, those rumors spread across social media. Schiff, the highest ranking Democrat on the House Intelligence Committee, authored a “rebuttal” to a memo authored by U.S. Rep. Devin Nunes, a California Republican and chairman of the committee. Trump previously tweeted that the Nunes memo “totally vindicates” him in the Russia investigation. Schiff’s oppositional role made him a natural target for conspiracy theories and fake news designed by some to erode his credibility. One such rumor was that Adam Schiff’s sister married George Soros in the early 1990s, and Schiff was acting as a patsy for Soros. As the congressional investigation into Russian meddling in the 2016 election heated up, false rumors that U.S. Rep. Adam Schiff’s sister married George Soros’ son went viral. There’s no truth to the rumor. George Soros son, Robert Daniel Soros, did marry a woman named Melissa Robin Schiff in 1992. However, a New York Times wedding announcement for the couple indicates that her and Adam Schiff don’t have the same parents. Of course, that means she’s not Schiff’s sister. Melissa’s parents were identified as Haskel and Marlene Schiff in the announcement. Meanwhile, Adam’s parent’s are named Edward and Sherrill Ann (Glovsky) Schiff. And Adam does not have a sister, he has an older brother named Dan. Crayola Bathtub Fingerpaint Soap Burns Child's Hands-Unproven! Facebook Limiting Number of Friends Posts That Can Appear in Your Newsfeed-Mostly Fiction!